I would recommend you stop by Mythos Restaurant for a good feed. If you’re lucky enough to get a table that is. We were there two nights in a row and the place was pumping, people were almost falling off the balcony trying to squeeze in. But even if you have to wait a little (or just rock up a little earlier than the normal crowd) it’s worth it. Food is delicious! So are the drinks, so good in fact the owner is happy to come and sit down with you at the table for a chat and a glass of wine or raki or whatever you are drinking (since my travel partner is related to every second person on the street in Palaiokastro, we also found out he was our waiter’s second cousin (the waiter is of course the owner’s son). Small world (or maybe just small island?!!)) and to have a chat. 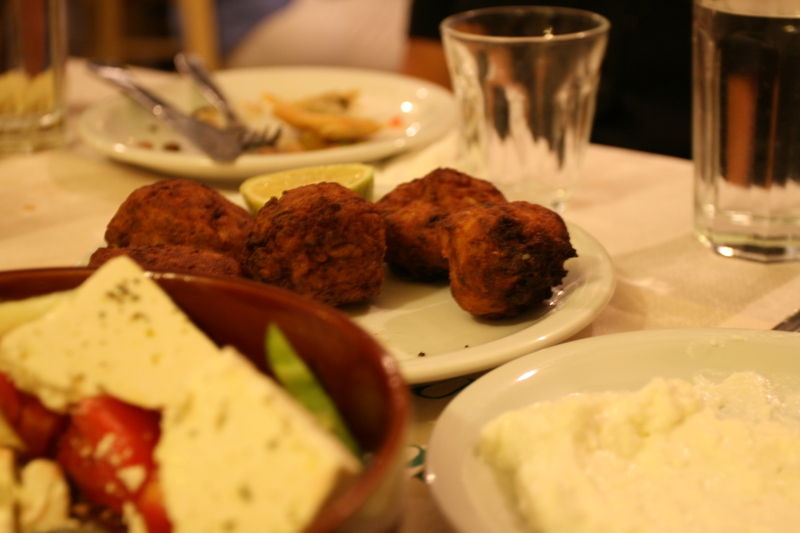 As I have mentioned a few times, there’s a lot of cheese going around at Cretan restaurants, from fetta (of course) to Xigalo (very special Cretan cheese) to Tiropites (cheese pies) and Saganaki (fried crumbed cheese – oh my lord). So much cheese and it’s so tasty, you can’t not have some. My favourite way of eating is having a little bit of everything (just like Winnie the Pooh), that works very well with Greek Mezethes (sort of appetisers, but works very well as a full meal if you have enough of them) where you can order lots of different things and everyone can share (sharing is caring, right? Even when we’re talking about cheese?) and taste more than just one dish at a time. Even if cheese is not your thing (how can it not be?? ), there is plenty of other things to choose from, there’s Greek salad (or actually Cretan salad, slightly different), lots and lots of meat and all the bread and fries you can dream of (I am actually surprised by how much fries the Greeks eat. There’s fries with everything! 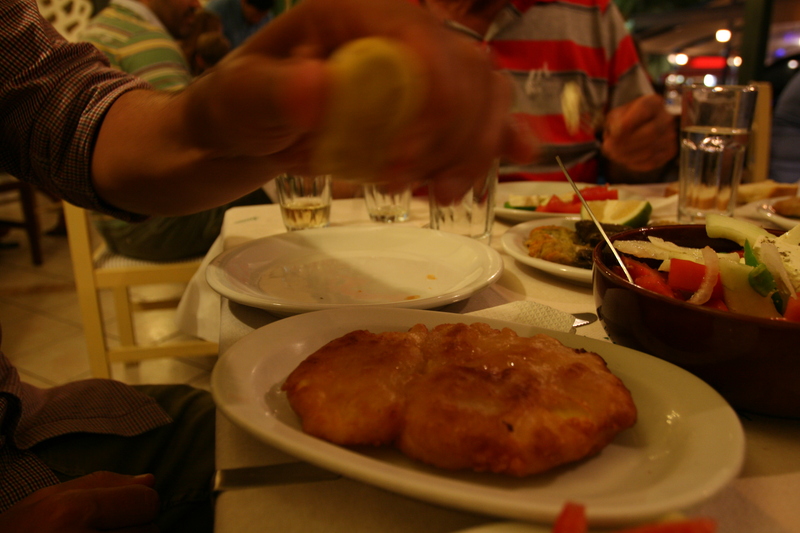 But easily avoidable, if you don’t want it) and the bonus is all the food is cooked in olive oil. Local, usually from the farm of the restaurant owner. If you love seafood, there’s more octopus and calamari here than you can handle. Grilled and drenched in olive oil and lemon. There’s generally three ingredients you will find everywhere; olive oil, lemon and oregano. Can’t be avoided, but who wants to avoid any of these, so very tasty! 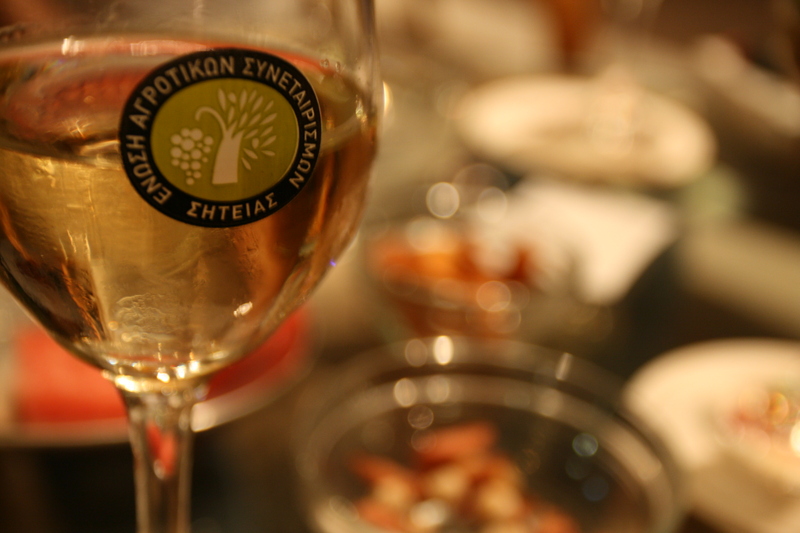 Having a glass of wine with the owner 🙂 He will be very happy to see you for dinner if you are in Crete and happen to stop by Palaiokastro. It’s well worth it! Let me know if you go! I absolutely love how fresh the food is here! Not once have we been to someone’s house without them saying these are from my garden or these are from the farm (like the other day I had lunch and the salad was from the garden, the rabbit from the farm and the fruit was from the backyard, picked minutes, if not seconds, before eating them). So fresh and so tasty. 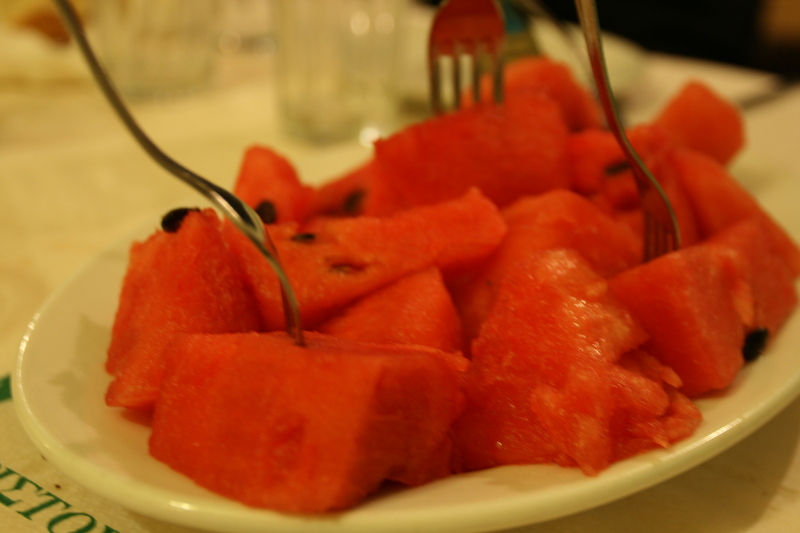 We usually finish off the meal with watermelon, and the watermelon here tastes like the ones I remember eating as a kid. It still has seeds, it’s deep red and very sweet. 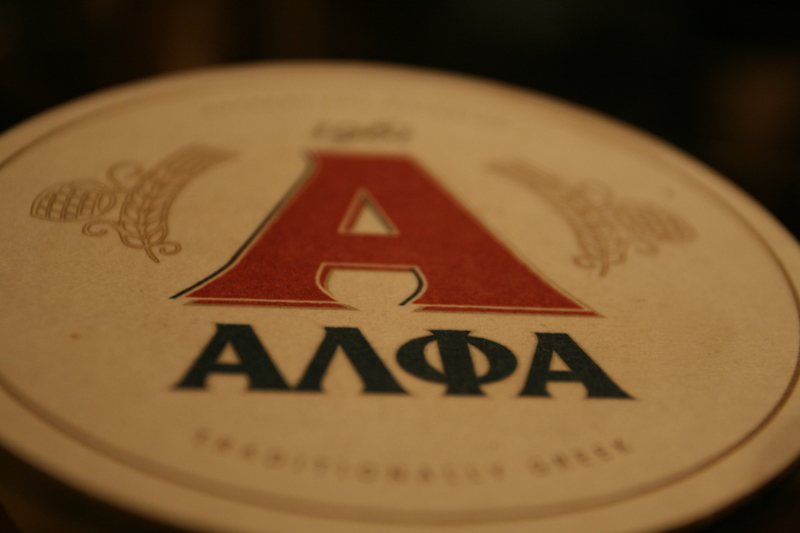 And great for dessert, because you don’t really want anything to heavy after a Greek meal. Maybe that’s something we can pick up from the greek culture? Yes, they do have a lot of amazing looking and tasting sweets, but it doesn’t seem like that for dessert (maybe rather with your morning coffee??). This entry was posted in Food, Travel and tagged Cheese, Cretan Food, Crete, Food, Greece, Greek Food, Lemon, Olive Oil, Oregano, Palaiokastro, Photography, Recommendation, Restaurant, Travel. Bookmark the permalink. Is this anywhere near the Minoan Palace? I feel like I’ve seen the sign before (although sadly, I don’t think we went to the restaurant). 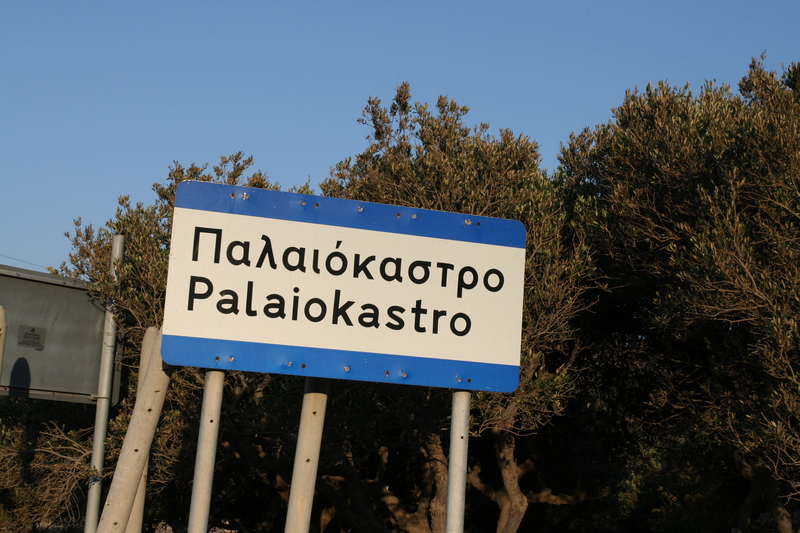 It probably is, there is so many Minoan places I get a little confused. 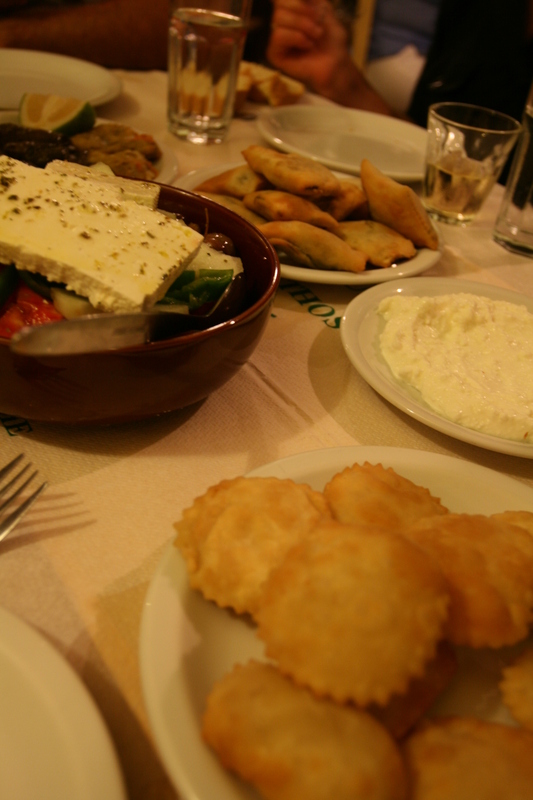 I think you’ve mentioned all of my favorite Greek foods in one post. Cant wait to get back soon. Oh. My. Mediterranean food is one of my (many…) food weaknesses. This looks absolutely wonderful. Aw, the food looks so great. 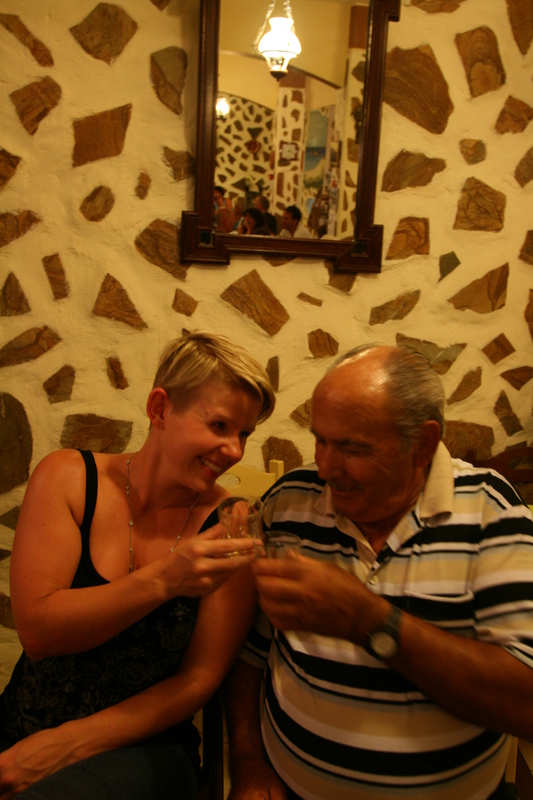 Crete is known for its exceptional food – and alcohol! I am ashamed to say I’ve only been there once in my life, but it is definitely on my to-visit-soon list. And that place you recommend seems special! Food is too good 🙂 And they keep pushing the Raki, but I can’t handle it! !